The Egyptians were not very experienced metalworkers, so most of their metal tools were imported from the north. Egypt’s strength was in chariots, not infantry. Using those fast chariots the Egyptians conquered many militarily inferior nations, including cities south of Egypt, which were very skilled in Bronze work. Greece, and the city-states around, manufactured much Bronze and Iron, and Egypt probably traded glasswork to them for the metal tools. The Egyptians were skilled in Goldsmithing though, as seen in the Pharaoh’s burial masks. This entry was posted in Uncategorized on October 31, 2011 by Captain Belaq. I searched through Genesis trying to find the earliest mention of metalworking in the Bible, and I found it, though only one verse long. It is Genesis Chapter 4, verse 22: ‘As for Zillah, she also gave birth to Tubal-cain, the forger of all implements of Bronze and Iron; and the Sister of Tubal-cain was Naamah.’ As you can read a few verses before, Cain is Tubal-cain’s great-great-grandfather or something like that. Bronze is an alloy of Cu (Copper) and Sn (Tin). From what I understand, metalworking was invented before the flood. It’s possible neither Noah nor his sons knew any metalworking, so they built the ark, went inside, flood came, flood went, they came out, and no-one knew how to work metal, where to get it, or anything. So because of the flood, the Ice age came, and gradually people re-invented metalworking in time for the tower of Babel. This entry was posted in Uncategorized and tagged Bible, Metal, Origins on October 13, 2011 by Captain Belaq. This Saturday/Sunday the gem and mineral show is going on at the Shasta fairgrounds in California. Many of you don’t know what a gem show is, so here it goes: the gem show is a farmer’s market that sells mineral specimens, gem rough, cut stones, crystals, tools, jewelry in general, and much, much more! Oh yeah, unlike a Farmer’s market, it goes twice a year, once in May, and once in October, whereas Farmer’s markets go once a week in the summer. When I go, I’ll be looking for Dremel bits, (mostly for polishing ) some polish, hopefully a grinder, gem rough, a good loupe, and a few other things. A lot of people from the club will be selling their stuff, but there will not be as many stalls as the May show, because the on the May one, invites are sent out all over, even out of the state. If you like to make, buy, or just plain look at jewelry, you should be there! It’s this Saturday through Sunday, at the Shasta fairgrounds from 9 AM to 5 PM. This entry was posted in Uncategorized on October 12, 2011 by Captain Belaq. 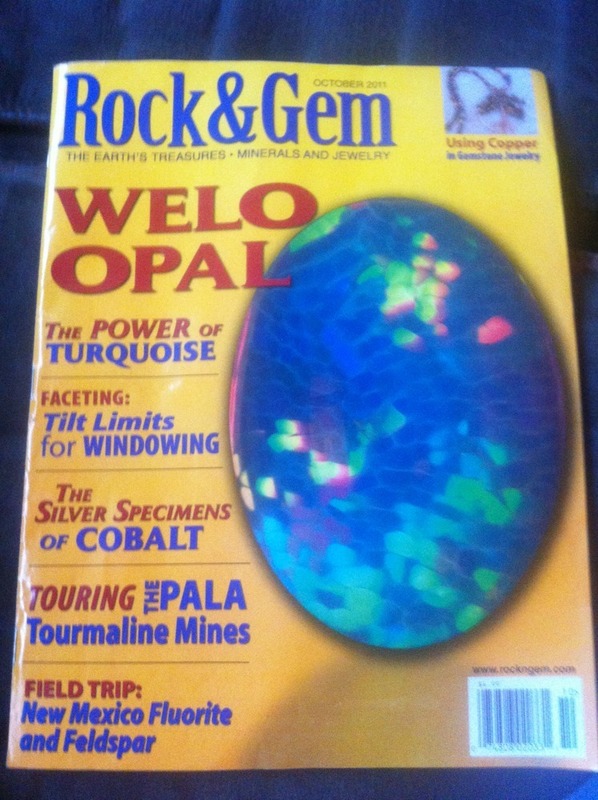 For my birthday (August third) Oma and her sister (who is also into gems and minerals) bought me a subscription to Rock & Gem magazine, a magazine that all the experts all over U.S.A. get (so of course people at the gem club get it). The magazine has a contest called craftsman of the month, where participants make something cool, take a photo, write how they made it, and send it to the editor. 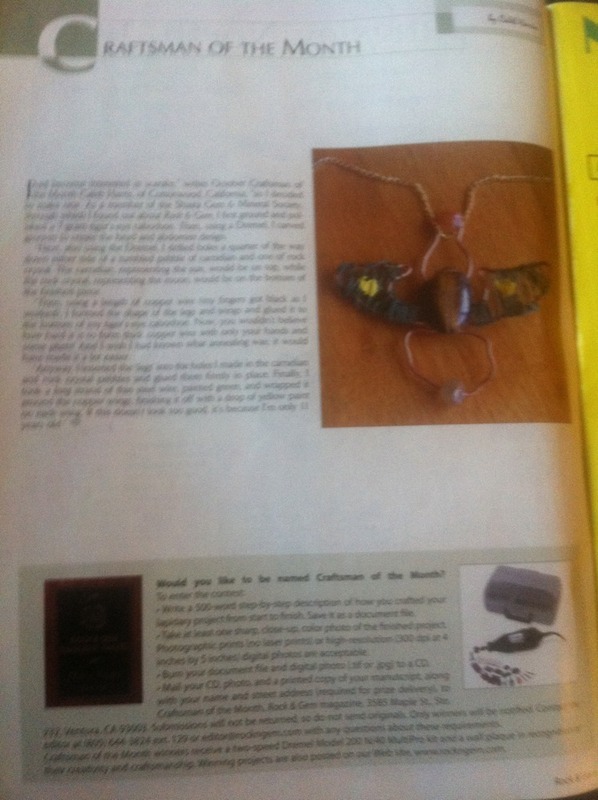 The winner’s photo of the object and their article of how they made it is put into the magazine and website, and the prize is a Dremel set and a wall plaque. Well, I made a scarab out of copper wire, steel wire, tiger eye, and a few other things, entered the contest, and presto! I won! If you want to see the article here’s a link. This entry was posted in Uncategorized on October 10, 2011 by Captain Belaq. O.K., now some people think there are classifications of solids, liquids, and gases. That’s N-O-T NOT true. You can’t classify water, for example, as a liquid. I’ll tell you why. In the atomic structure of a solid, each atom has a strong, atomic bond with eachother. In a liquid, those bonds are super weak, causing the atoms to slip and slide over eachother. In a gas, the Atoms are just floating around eachother with no bond at all. (Oh, heat breaks bonds, just to let you know) So, for water, at 0 degrees celcius, there is not enough heat to weaken bonds, so the atoms form a rigid, hard structure, so forming what we call Ice. More heat weakens those bonds, letting the Atoms slide around, and so is Water. Even more heat totally breaks those bonds, and the Atoms float around eachother at a distance, forming what we call Steam, a gas. When you burn wood, the heat from the fire totally breaks the Carbon bonds, and, being farther apart (less dense) than the Oxygen bonds around them, just float away as Smoke. 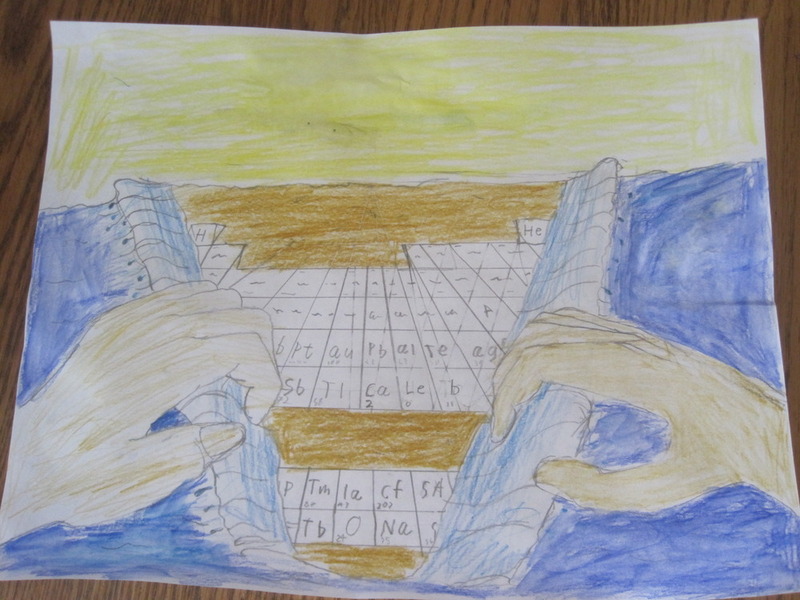 The photo above is a symbolic picture of God (on day 2 of Creation) parting the waters, making land, and revealing the periodic table of Elements. By the way, can you find where on the picture I hid my name? (It’s real tricky, it took dad a while to find it). This entry was posted in Uncategorized on October 5, 2011 by Captain Belaq.